The growing season is coming to a close and we have reached the end of our 17th season of the NYS IPM Weekly Field Crops Pest Report. We would like to thank all the producers, extension educators and field consultants for providing us with in-field observations each week for the report. Your data is critical to us for providing information statewide each week on the status of pests in the field. We will be posting an end of the season survey to determine what impact the report has had statewide. This survey helps us fine-tune the report each year. Please make any suggestions on how we might be able to improve the report. This coming winter we will publish some IPM information via this blog site. There are many reports of different corn diseases appearing in field corn. The good thing is that diseases that infect corn late in the season do not impact yields that much. Some of the diseases observed this week are anthracnose top dieback, Anthracnose top dieback, Northern corn leaf blight, Gray leaf spot, Northern corn leaf spot, Corn ear rots and Corn stalk rots. A point of concern with ear and stalk rots are mycotoxins. If you think you might have ear and stalk rots it would be a good idea to test them for potential mycotoxins. Horseweed (aka marestail, Conyza canadensis) and goldenrod (Solidago spp) can appear similar and both have wind-dispersed seed. Here’s how to tell them apart and control them. Horseweed leaves are widest near the tip, while goldenrod leaves widest near the base or middle of the leaf. 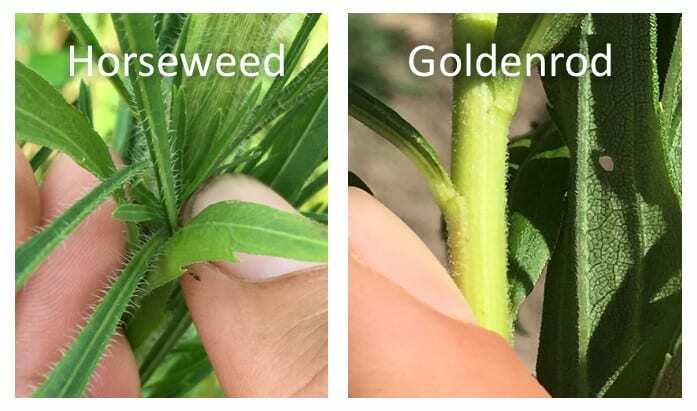 Horseweed is hairy, especially on stem and leaf edges, while goldenrod has only extremely small hairs on the stem and underside of leaf veins. 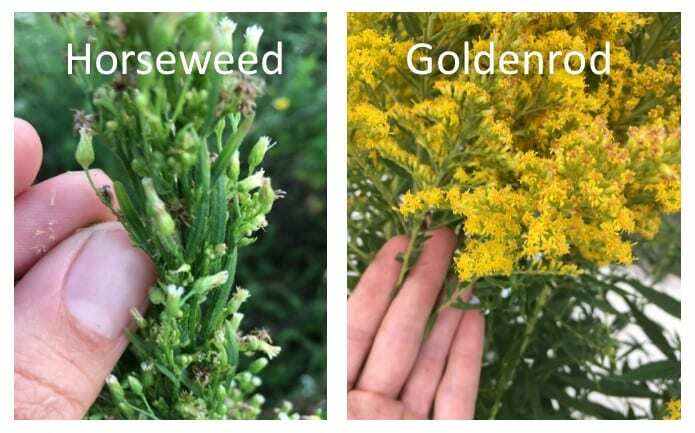 Horseweed has white flowers, while goldenrod has yellow. 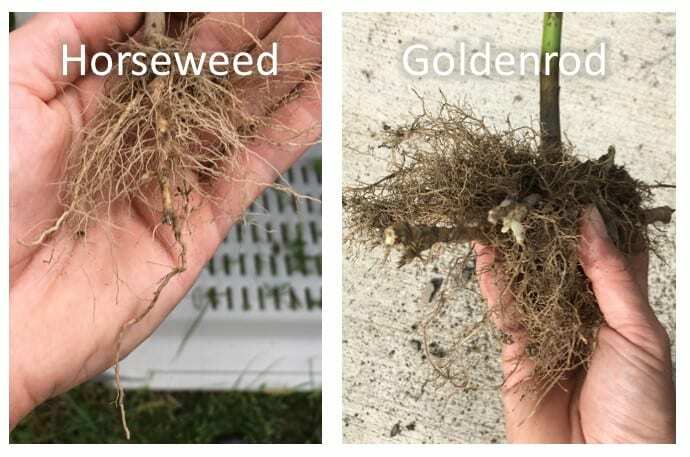 Horseweed has a taproot, while goldenrod has fibrous roots and horizontal rhizomes. 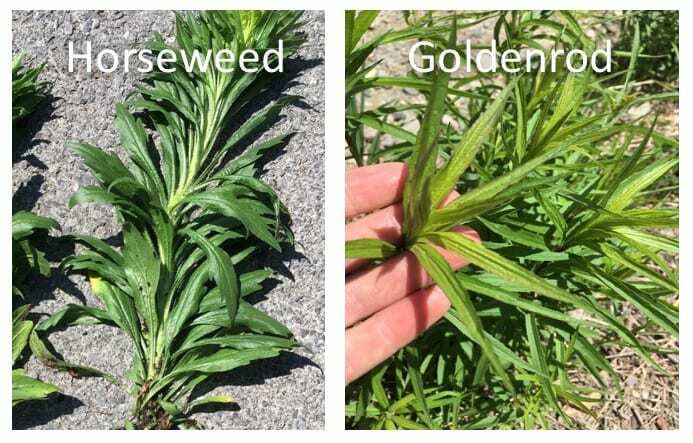 Horseweed is an annual that has demonstrated resistance to glyphosate and ALS herbicides in some areas of New York. In these areas, it’s important to “start clean” using tillage or burndown programs using synthetic auxins (Group 4) or contact herbicides when the weed is less than 4” tall. Pre-emergence herbicides should be used to reduce in-crop horseweed emergence. Tillage and cultivation are particularly effective since horseweed emerges from a very small seed and newly emerged plants are tiny. Since horseweed can emerge in the fall as well, winter cover crops can be used to keep fall-emerging horseweed small enough to be controlled in the spring (John Wallace, personal communication). Goldenrod is a perennial that is most common in abandoned hayfields. It is well-controlled by systemic broadleaf herbicides, especially synthetic auxins (Group 4) applied in the fall. Frequent mowing of hayfields will favor grasses over goldenrod. Recording pest issues help with the future! Did you have insect pests, diseases, weeds or other pest problems with corn, small grains, soybeans, alfalfa or other forages this summer? Do you want to avoid such problems in the future? Field pest RECORDS is one of the practices we need to do to prepare for or avoid many pests that cause reduced yields or quality of our crops. By keeping records on our crops we can better plan for the next year. So if you had a problem with a pest this year, write it down before you forget. In recent years we have had a lot of corn in New York infected with grey leaf spot and northern corn leaf blight. There are hybrids that have at least moderate resistance and yield much better than hybrids that are more susceptible. If you know the hybrid you planted was susceptible, then you can avoid it in the future and select one that has stronger resistance. You could also decide to rotate, because you had observed the disease(s) in the same field for several seasons. By keeping records on potato leafhopper (PLH) on alfalfa you may have observed that they reached threshold 2 times over the course of 4 years. This will reduce yield and the quality of the forage. By selecting a PLH resistant cultivar of you can avoid this in the future. By keeping track of rotation you can avoid some risk to diseases like Fusarium head blight in small grains, like malting barley. By not planting into a former corn field you may reduce the risk of getting the disease because it can over winter on the crop residue. Were there new weeds or weed escapes you did not expect this year? If you had weed escapes you might reconsider your selection of weed control products. Are your pesticide use records up to date? Rates, dates, efficacy, rotational restrictions, etc. It is always important to keep pesticide records up to date. Did you have western bean cutworm damage this year at lower levels? It would be good to keep track of this pest since it is new to NY and can become a problem in the future. Did your soybeans have white mold this year? Keep track of this because the disease can survive at least 7 years in the soil. You want to make sure not to plant susceptible soybeans back in that field for several years. Don’t wait too long….there are too many pests and other factors that may keep you from remembering. Record it on a map, in an app or write it down! *Monitor potato leafhopper, foliar, systemic and crown rot diseases, signs of alfalfa snout beetle (in counties where ASB has been confirmed). *Monitor new seedings for potato leafhopper, pythium blight, phytopthora root rot. *Plant winter small grains after the Hessian Fly Free Date. *Monitor late-season corn pests including European corn borer, corn rootworm, western bean cutworm, slugs, foliar diseases such as northern corn leaf blight and gray leaf spot, ear molds, stalk strength/lodging potential, weed issues, nutrient deficiencies, vertebrate damage. *Check water sources, mend fences as needed. *Expect an increase in fly numbers in barns as flies seek warmer habitats to escape cooler outside temperatures. *Monitor animals and barn area for house fly, stable fly and other pest management needs including presence of rodents and birds. *Check feed bunk / water source locations for signs of stable fly breeding (moist undisturbed organic matter – spilled feed, round bales, etc. ), minimize source of moist organic matter i.e. fly breeding areas in barn and in adjacent animal exercise yard.